Happy day after May Day! My grandma's (and in a month my parents') small town celebrates May Day every year. The first Saturday of the month is filled with Maypole dancing, songs, a May Day queen and royalty, and a program. It's the perfect way to kick of one of my favorite months. May means beautiful blossoms, warmer weather, Mother's Day, and the anticipation of summer. Love it all!! Anyway, I'm over with Tanya at twelveOeight today. 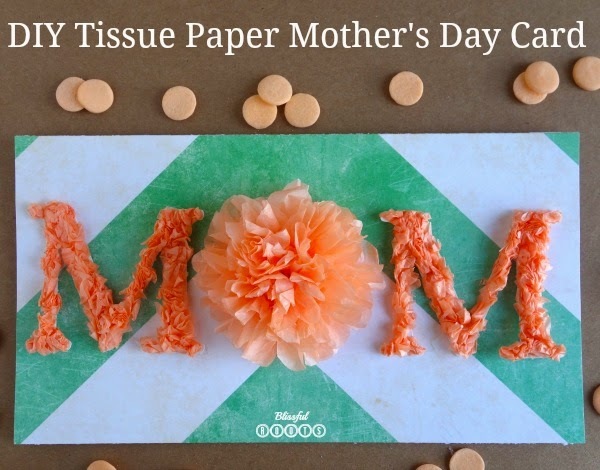 I'm sharing an extra special DIY card you can make for any or all of the mothers in your life. I'm thrilled with how it turned out! It's a project that will take you back to your elementary art days. Tissue paper and glue. Remember it? I remember loving it! I do have to say it's a bit time-consuming, but any mother is worth some extra time, right? Stop by to visit, and check out my entire post here. Have a wonderful weekend! I wish I was making the two hour drive to Mendon to watch the May Day festivities, but we have a few soccer games that little boys don't want to miss. Maybe next year! What a fabulous card! I was at the store a few days ago looking for a card for my mom and decided I would just make one instead....I am going to give this one a try! She'll love it!! I end up making my own more often than not, Cathy. I can never find just what I'm looking for! Let me know how yours turns out! I love a gift card any day. When people say they aren’t personal, I think that’s crazy. If someone took time to get me anything, that’s personal and much better than something I’ll Ooh and Aah over and then put in the bottom of my drawer never to be seen again.